How do I get a copy of my work without highlights? 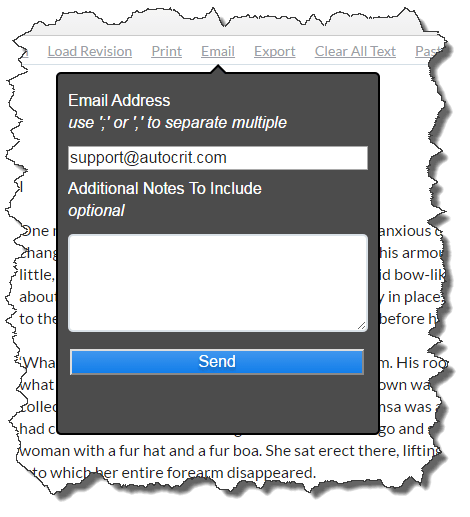 The AutoCrit Editor allows you to print, Email, and export your text by clicking on the appropriate link as shown below. Data exported from the Editor (left side of the screen) will not include the analysis results and highlighted text. If you wish to see highlights, click here for more information. Selecting the print button will bring up a traditional print dialogue box. Simply select your preferred printing device and press print. Also note that many computers have the ability to print directly to an electronic file format such as PDF or XPS. This is a handy option when distributing your files to others. Selecting the email button allows you to send a complete copy of your text directly into your email inbox. A dialogue box will appear prompting you to select a desired email address and allow you to add additional notes. Keep in mind that the email option will send ALL of your text within the email. If you are working with a large amount of text or have tight spam controls engaged with your email software, you may not receive the email. The email may end up in your spam or junk mail folder. AutoCrit sends the message from the email address: AutoCrit Mailer <[email protected]>. If you are having problems receiving emails, please review your email software help documentation to troubleshoot. 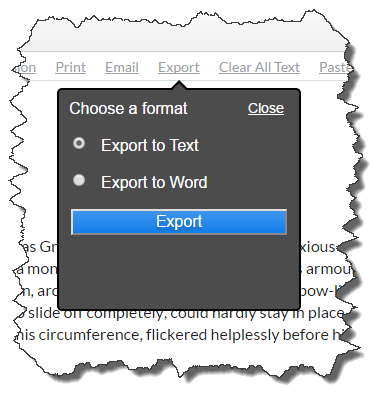 Selecting the export button allows you to download a copy of your work in either text or Microsoft Word format. The files exported from AutoCrit are saved as a downloaded file by your internet browser. Each browser is slightly unique, but Firefox, Chrome, and Internet Explorer will display recent downloads if you use the shortcut Ctrl+J while in the browser. Note that when exporting your file to Word, AutoCrit creates a file with extension .docx. You may not be able to open this file if you are using an older version of Word. The good news is that there is a free converter available from Microsoft which should allow you to open the file.